The online dictionary selection dialog is extremely simple. 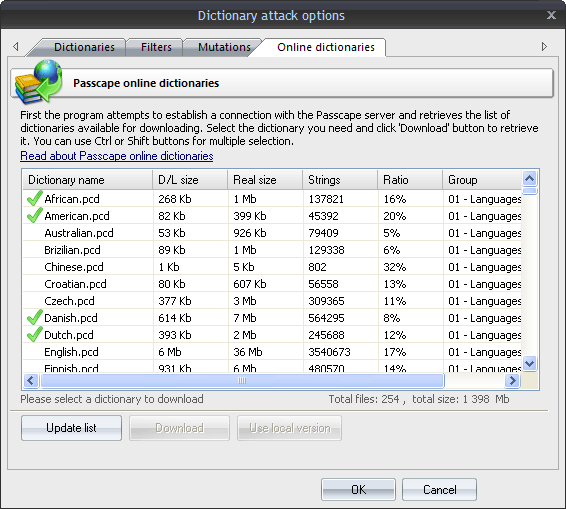 When it opens up, the program attempts to establish a connection with the Passcape server and then retrieves and displays the list of wordlists available for downloading. Some of the dictionaries are large. For instance, the size of 'music_songs.pcd' is more than 59 MB in the compressed format. Naturally, retrieving such a large amount of data may take some time, which depends upon file size, the bandwidth of your Internet connection and network load. All online (and some additional) dictionaries can be ordered on CD. The total size of all the wordlists is over 10 GB. You can also share your own dictionary with us by e-mailing us the dictionary or the link where it can be downloaded. The word-lists are used in common dictionary attack, combined dictionary recovery, pass-phrase attack, etc.